When I plunged into instrument training, I did so with the knowledge that, much like an engine that does not run, skills that go unpracticed become rusty. Nonetheless, I did not anticipate how challenging it would be to maintain my proficiency level. After all, I love to fly and do so often. What I failed to appreciate was how challenging it would be to find either suitable IMC for practice or a fellow aviator available to ride along on a VFR day as safety pilot. This became particularly challenging when the never ending winter of 2013-2014 settled over the Great Lakes with ice-ridden cloud cover. For the uninitiated, there are two concepts in play here. The first is the legal construct of "currency" that requires me to have performed six approaches, an indeterminate number of holds, and interception and tracking of courses within six months previous to acting as pilot in command on an IFR flight. It is a minimum amount of recent experience required by the FAA in hopes that pilots flying on instruments possess a modicum of skill level. But currency is only a minimum, an easily quantified check-box hurdle on the road to proficiency. Proficiency is far more important. Proficiency at instrument flying is not so easily measured or legislated as currency. Proficiency is something that a pilot understands in his or her gut. Being current does not assure being proficient and it is possible to meet the legal currency requirements for an IFR flight without having the skills needed to perform safely. As I have admonished before, it is essential to know your limits when contemplating taking flight. After earning my instrument rating in July 2013, I made several cross country flights on IFR flight plans to maintain currency and build experience beyond my training. Sometimes, I encountered some actual instrument weather conditions en route, which served as excellent practice. Most of the time, weather at the points of departure and arrival was frustratingly excellent and, as a result, I only logged one approach during my cross country exploits in the latter half of 2013. Because this situation persisted for months, despite being legally current, I began to question my proficiency level. In December, Darrell and I traded off safety pilot time. I flew four approaches that afternoon: two ILS, one VOR, and one RNAV. To my delight, I was still sharp and the approaches were well-flown. I should have flown more, but I needed to put the airplane back in the barn in time to board a commercial flight to Washington, DC where I was scheduled to present at a conference. After several cancelled flights and hours spent at Greater Rochester International, it was clear that I would not arrive in Washington in time to give my presentation. Fortunately, the conference was cancelled due to weather. To my colleagues who fruitlessly made the slog to Washington, my failure to appear made me seem far more clever than I actually am. In other words, I should have flown a few more approaches that beautiful Sunday afternoon. Though Darrell and I thought that we could knock out more instrument practice in January, we were wrong. I only flew twice in January, brief impromptu sightseeing flights around the local area. Thus, my first period of legal instrument currency following the checkride lapsed at the end of January, short by one instrument approach. All the moving parts required to regain currency finally came together on March 17: I was available to fly, Darrell was available to ride right seat, and the weather was good. As it turned out, Darrell needed to drop his airplane at Williamson and needed a ride back to Le Roy. Win-win. We departed Williamson and requested a practice RNAV-10 at Rochester. Immediately after that, Rochester vectored us around to the final approach course for the ILS-4. From there, I flew the RNAV-10 into Williamson, then direct to the Geneseo VOR for a course reversal that set us up for the VOR-A into Le Roy. I was rusty. If my instrument prowess was grocery store hamburger, there would have definitely been an off odor in the air. While I stayed within PTS standards, I was working much harder at it than I had back in December. 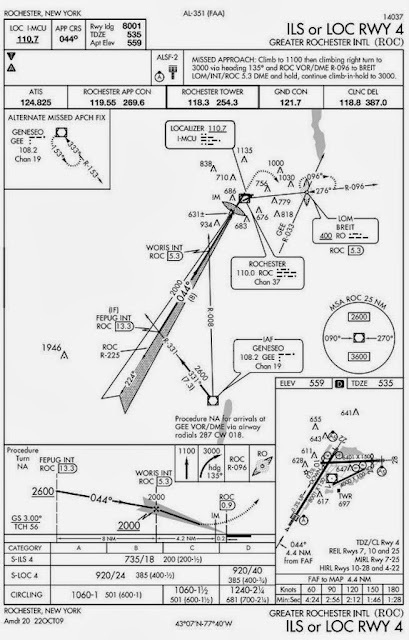 Rather than nailing and holding the glideslope on Rochester's ILS-4, I seemed to vacillate from one dot high to one dot low. I was not in danger of plowing into anything, but it was neither as smooth nor precise a performance as I gave in December. Yes, instrument skills are indeed perishable. 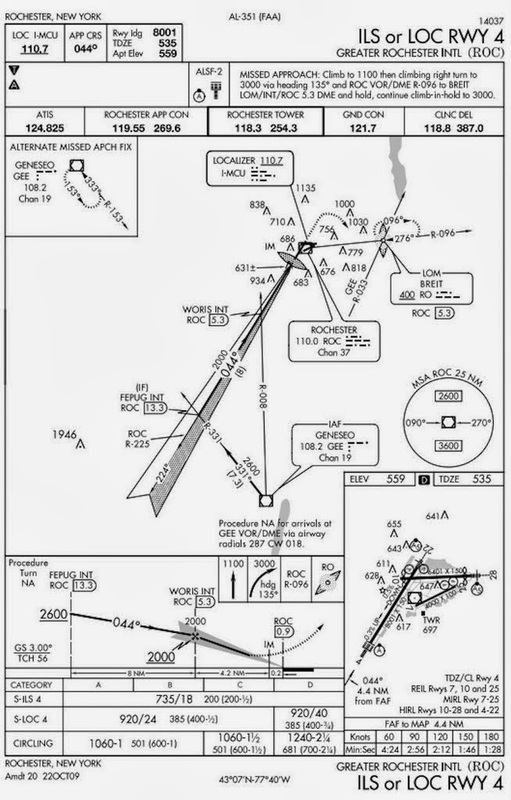 I chose to fly the published missed approach procedure for the ILS-4 because the holding fix (BREIT) is one of those defined by the intersection of two radials (see above). For whatever reason, I find these types of holds to be more challenging to manage mentally than a hold anchored to a VOR or GPS waypoint. In this case, a GPS holding fix exists (BREIT) and I could have leaned heavily on the GNS-430W to fly it, but I deliberately chose to do things "old school" for the exercise. I got so busy tuning and identifying the Rochester VOR once I went missed, that I flew right through the Rochester R-096 radial that I needed to intercept. I discovered this mistake a couple of dots (4°) right of course and corrected immediately, but it was still sloppy. The hold itself was flown well, though. Though the skills seemed to come back by the time I was done flying (along with my currency), I still want to build additional proficiency and confidence before flying in actual weather this spring. As dusk settled over Le Roy, we landed; one of those perfect maneuvers where the wheels roll gently onto the pavement as the airplane is flared. It is a rare treat when such a landing is made in the presence of a fellow aviator! Ray transmitted a welcome to us on the Unicom frequency as the beam of my landing light swept across my old hangar. After dropping off Darrell and his oldest son (who served capably as ballast and entertainment during the practice approaches), I socialized with Ray for a few minutes before launching into the evening sky. It was truly a perfect night for a night flight; smooth and clear, the ground aglow with earthbound constellations. As I transited Rochester's airspace, I received traffic alerts from air traffic control for aircraft as far away as nine miles and spotted every single one of them, even the most distant. That never happens during the day. Partway home, I saw a red smudge appear across a narrow arc of horizon. As I stared, it broadened and climbed into the sky. This crimson apparition was the moon, which rose completely above the horizon in the brief time required to fly from Rochester to Williamson. It was spectacular. Ten miles from Williamson, I ran the "approach to landing" checklist and discovered a landing light failure. It was working when I left Le Roy. That's fine, I thought to myself. I've landed without it before. I'll just turn up the runway lighting to maximum intensity so that I can see the runway better. Piece of cake. Turning from base to final, I detected a huge flaw in this plan. The runway lights were still buried under snow banks. All that was visible were the threshold and runway end identifier lights. The full moon was still too low on the horizon to illuminate a runway carved out among trees. I lined up with the black hole bracketed by the threshold and runway end identifier lights. On short final, I put the airplane into a shallow nose up attitude with a low sink rate and carried power all the way down until the wheels made contact. A few feet above the runway, the Warrior's position lights illuminated snow banks lining the runway and I made a slight adjustment to maintain center line (catching a snow bank with a wing tip would have meant a really crummy end to my evening). I consumed much more runway than usual with this technique and the touchdown was a bit firm, but I was down safely. I rolled all the way to the west end of runway 28. The west end of the airport was frighteningly dark without the aid of a landing light. Fortunately, an LED flashlight directed out the windscreen served well as an improvised taxi light. In hindsight, a diversion to a different airport with visible runway lighting may have been a better choice. I could have landed more safely, replaced the landing light on the ground (I keep a spare in the airplane), and returned to the black hole that was Williamson-Sodus. Still, I performed better than a transient aircraft earlier this year that landed in the snow next to the runway at night, a trike that somehow managed to neither flip over nor suffer a prop strike. Regardless, I am currently researching LED landing lights approved for Cherokees. Upon rising two feet off the ground, the hangar door abruptly stopped and I was suddenly engulfed in darkness. Grumbling, I hiked to the other side of the building and reset the circuit breaker. Once the airplane was finally put to bed, I strolled back to the clubhouse, noticing that the full moon was finally high enough in the sky to peer down upon the airport. Where were you thirty minutes ago when I needed you? Despite the challenges, I accomplished a lot that evening. I am legally current again and significantly less rusty on instruments. With one more session, I think that I will actually feel proficient, too. I was also able to spend some time with my friend Darrell, see an incredible moonrise, and develop a newfound appreciation for the humble landing light. Ten years ago today, I stood on the concrete apron of a regional airport in Oklahoma while bathed in warm springtime sunlight and spoke words into a cell phone that made me an aircraft owner. I struggle with a dichotomy of feelings about this. At times, I have a sense that the airplane has always been a part of our family. Yet memories of its purchase are so strong that, surely, they cannot be a decade old. The tale of how my 1979 PA-28-161 Warrior II came into the family can be read here. 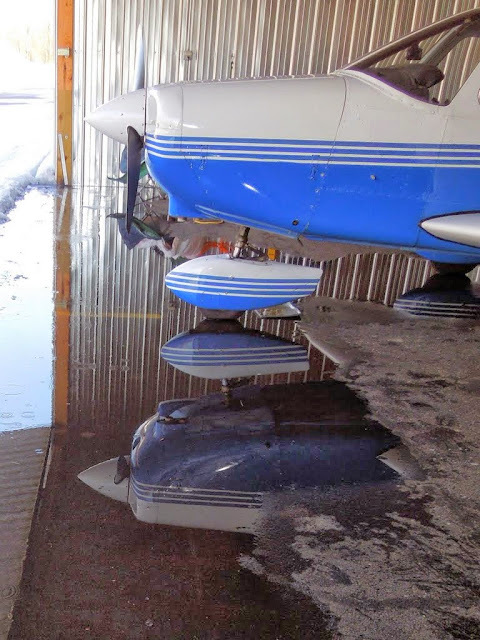 When I reached the hangar in Williamson, I discovered two Warriors within; the real airplane and a phantom version reflected in the mirror-like flood water encroaching under the door. The flood resulted from an abrupt thaw that occurred while the nearest drain was blocked by ice. Still, Warrior 481 and I made a brief local flight together, doing some steep turns, stalls, and other airwork along the way to commemorate a decade of adventure. Over the last ten years, I've logged 1077 flight hours (86% of my total flight time) in Warrior 481. This ship has been our magic carpet to twenty different states, maintaining connections with friends and family, and conveying us to places both remote (mountains, islands) and metropolitan. We've landed at high traffic airports and quiet grass strips. Warrior 481 has been a good compromise for our missions: a "go someplace" airplane also happy to fly local "low and slow" flights, inexpensive and simple to maintain and operate, and a stable instrument platform.